GAITHERSBURG, Md., Dec. 28, 2017 /PRNewswire/ -- SodexoMAGIC, a partnership with Magic Johnson Enterprises and Sodexo, a food services and facilities management company, is lifting the curtain on how it prepares to serve 90,000 fans on New Year's Day. SodexoMAGIC provides concessions at the Rose Bowl Stadium year-round. 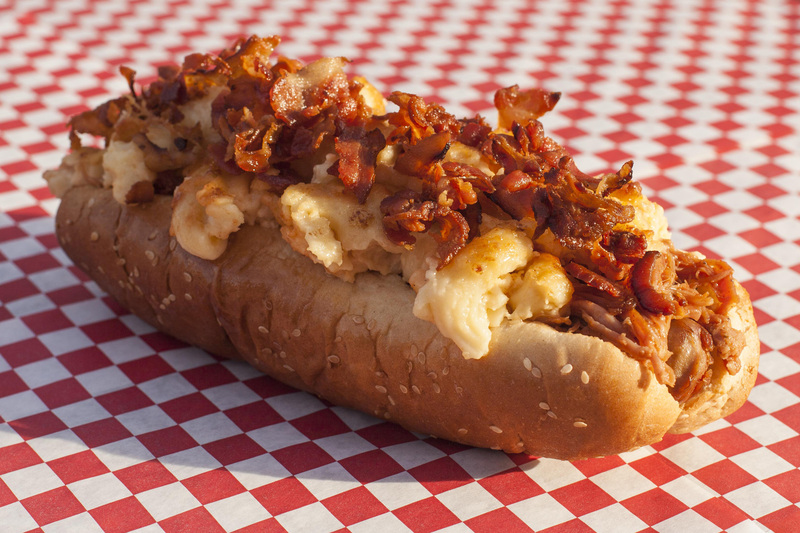 The Granddaddy Dog features a quarter-pound hot dog topped with mac-n-cheese, pulled pork, bacon and barbecue sauce. 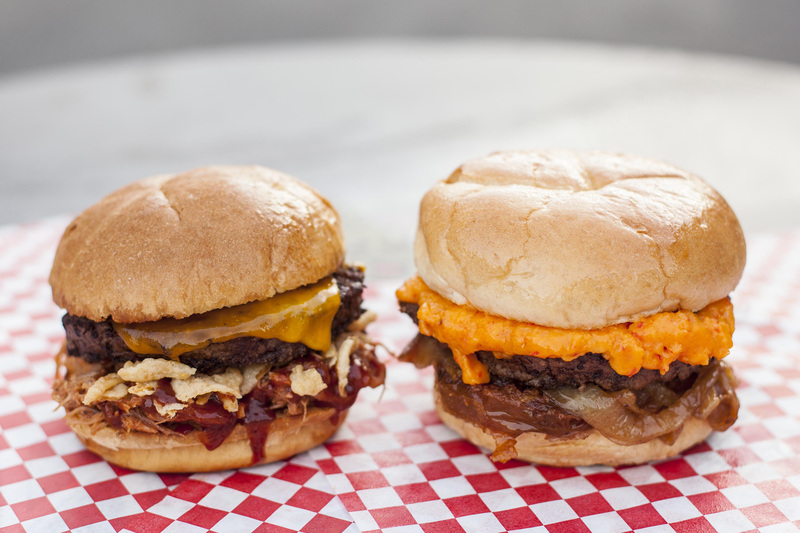 Georgia vs Oklahoma burgers - Both burgers feature a half-pound burger, but the Oklahoma burger features American cheese, crispy onions, and BBQ pulled pork, while the Georgia burger is topped with pimento cheese, fried green tomatoes and grilled onions. The SodexoMAGIC team created specialty items for this year’s game at Rose Bowl Stadium on Jan. 1 featuring Georgia and Oklahoma. What Does it Take to Serve 90,000 Fans at the 2018 Rose Bowl Game? 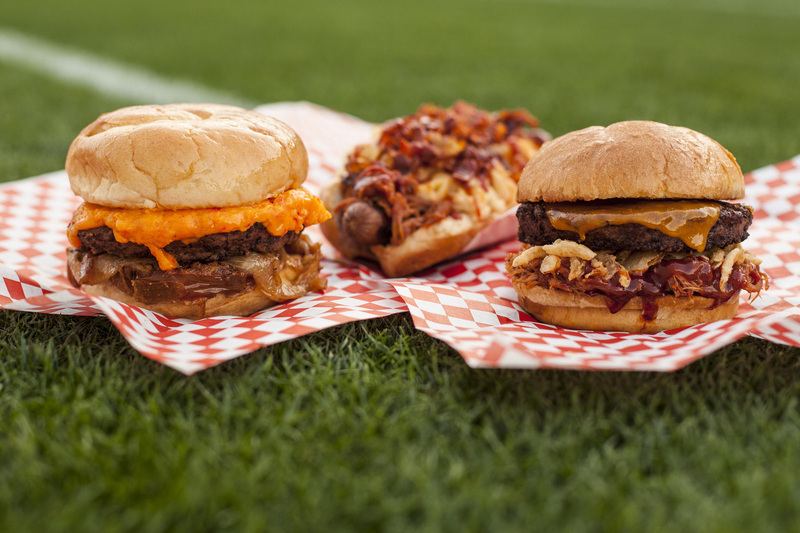 Fans can expect game-day favorites on January 1 like big pretzels and beer along with signature Rose Bowl dishes, such as the Granddaddy Dog – a quarter-pound hot dog topped with mac-n-cheese, pulled pork, bacon and barbecue sauce – and Farm to Fan Nachos – house-fried chips, seasoned beef and three locally-made salsa toppings. This year, two specialty burgers representing each team will be featured on the menu and all are encouraged to vote for their favorite team burger at @SodexoUSA. "SodexoMAGIC is proud to partner with the Rose Bowl Stadium to provide a spectacular fan experience for the 90,000 people who come to cheer on their favorite football team," said Kevin Hengehold, SodexoMAGIC General Manager at the Rose Bowl Stadium. The driving force behind the event is the dedicated staff and volunteers. 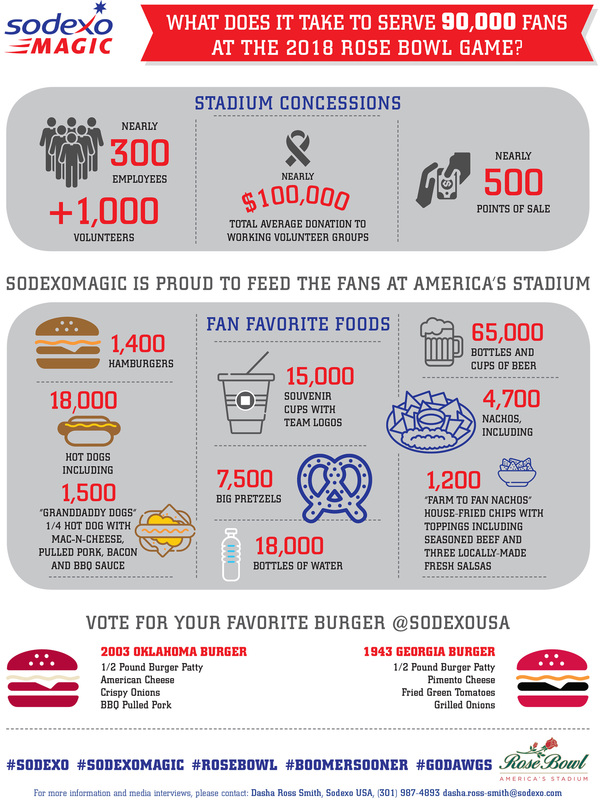 In addition to 300 staff, SodexoMAGIC coordinates with nearly 1,000 volunteers from local high schools, churches and community groups to help sell concessions and raise money for their organizations. SodexoMAGIC has earmarked a percentage of its game-day sales for charity, resulting in nearly $100,000 in donations per game to community groups – around $600,000 annually. Additionally, SodexoMAGIC has partnered with Pasadena Hot Meals for the past seven years to deliver food after each stadium event to people in need within the community. SodexoMAGIC is a partnership with Magic Johnson Enterprises, owned by Earvin "Magic" Johnson, and Sodexo USA. It was formed in 2006 to empower communities with best-in-class food and facilities management solutions, including menus drawing on the expertise of Celebrity Chef G Garvin and healthy solutions from health expert and author Dr. Ian Smith. SodexoMAGIC recently celebrated a 10-year anniversary and boasts nearly 5,000 employees located across 49 clients and 1600 sites. Learn more about Sodexo USA at its corporate blog, Sodexo Insights.